View my content at my Blog! Supporting me is completely optional. If you do, you can get a chance to win a pixel art of any character you like. Just choose the Monthly Prize Draw Tier and you will be in the running for a pixel art commission. One winner will be announced at the start of each month. By supporting my patreon you will also be supporting my indie game's development. Make no mistake - Patreon or no I will fight tooth and nail to get my projects to see the light of day. As the primary resource it needs is time. I'll be very thankful to anyone helping me here! Hey, that's me - Freedom2Fight! I am an amateur artist, video game enthusiast, gamer and aspiring video game developer. I absolutely love video games. I love creating digital illustrations whether it's pixel art or other. I love writing stories. And I'm truly serious about making video games, writing stories and making art full-time. I made this Patreon to make it viable in the long term. What are you working on right now!? Currently I am working on Project_DesertRose! It is an action adventure, side-scrolling brawler that contains role playing game elements, set in a sand-box style setting. 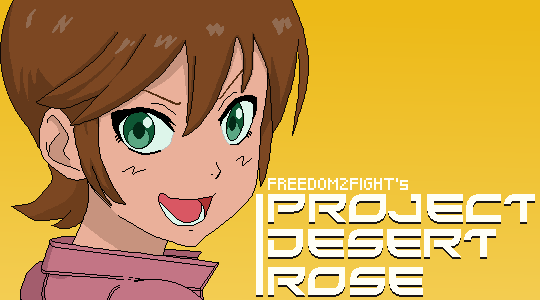 PROJECT_DESERTROSE : Side-scrolling, beat-em-up, action RPG! In a world much like ours but a bit sci-fi, trouble is brewing. In the city of Desert Rose, public order is eroding. The police force is embroiled in a scandal that has shaken public trust. Juvenile delinquents, hoodlums are on the rise and crime is becoming rampant. The devious elites are plotting to take advantage of the mounting chaos. All the while the robotic reaverform threat is reappearing. the people of Desert Rose, help deter delinquents by beating them up and if it comes down to it - fight the reaverform threat! Get a chance to win a pixel art commission! You will receive a message if you win. The Prize Draw will commence once this goal is reached!